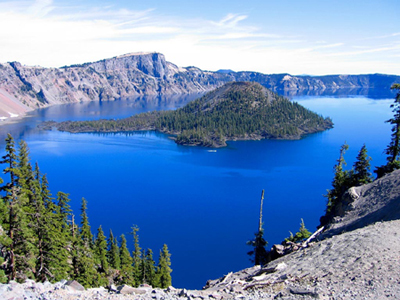 Oregon Lakes Association is pleased to announce that it will be holding its annual conference at Crater Lake this year. You won't want to miss this rare opportunity to visit Oregon's most famous lake and landmark. Register Today! While the technical portion of the conference is Saturday, there will be a dinner Friday at Annie Creek Restaurant at Mazama Village from 6:30 - 8pm. This dinner is on your own monetarily, but you'll be surrounded with your fellow lake enthusiasts and association members as we kick off the conference. Saturday's program starts with Registration at 8:00 and runs all day. Lunch is included, and there is an optional Potluck BBQ dinner for $10.00. Please bring your favorite beverage, snack item and/or dessert. The BBQ will be serving up the rest. For those interested, contrary to a statement in the August newsletter, alcohol is allowed in the park. Sunday, don't miss the chance to explore Oregon's most famous lake and landmark through a guided boat tour on Crater Lake to Wizard Island. Seating is limited, and the special Oregon Lakes Association price of $33 is available only through the this website. If you are interested in the Crater Lake and Wizard Island Boat Tour you must register for that event separately. Please note that your annual membership is not included in this registration. This is a change from previous years as we transition to a new membership based website and online event registration. However membership discounts do apply. For those non-members registering, please consider joining OLA to not only take advantage of an immediate discount, but to also have access to expanded features on the website, discounts at other events, and of course your year-round support for quiet waters! Also, please note that park entrance fees, nor accommodations are included in your registration. Park fees are collected by the National Parks when you enter the park, and accommodations can be found locally.